One of the best parts of summer is breakfast outdoors. On a patio, a deck, a balcony, in a back yard, near a beach, under elms. Wherever you are in the world and whatever your outside, breakfast in morning air is simply liberating, naughty even – if you stay in pajamas. I’m sitting out in the sun, next to a bowl of homemade granola. Fresh, juicy nectarines are winking at me and a pot of yogurt, thick and creamy, is waiting to join the fun in the bowl of cereal. I started making granola because I couldn’t find what I was looking for in France. Here, muesli (a sort of uncooked granola, can I say?) is the grainy cereal of choice. I have become a big fan. Sometimes, though, I miss the crispy, just slightly sweetened texture and taste of granola. Even back in the States, I wouldn’t buy it very often because it would be too sweet. I prefer adding fresh seasonal fruit (like the aforementioned nectarines, ripening all too fast under this morning sun). 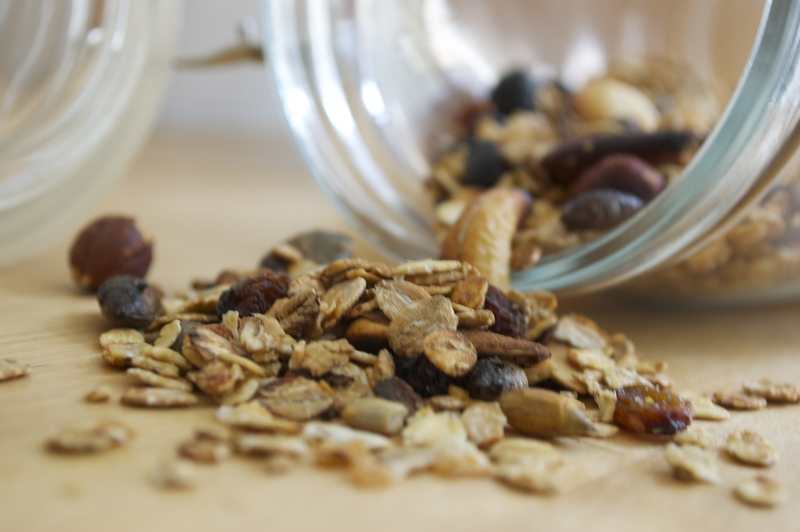 The advantage of making any cereal at home is that you can choose how much to sweeten it (and with what type of sweetener) and also which dried fruits and nuts to add. I, for example, am not a fan of coconut shavings in my cereal, whereas some people I know love them. I also only like a few raisins, but lots of almonds. This recipe uses my (current) favorite ingredients, but you should play with yours as you like – that’s the fun of cooking, isn’t it? My only advice is to be careful with dried fruit (like raisins) and seeds (like pumpkin or sunflower) as they cook faster than the cereal and nuts. I’d recommend adding them to the baking granola a few minutes after you put it in the oven. The first time, my raisins turned out black. 1. Preheat oven to 200°C (400ºF). 2. Combine cereal and nuts in a large bowl, and coat with a thin layer of maple syrup. Mix well. 3. Spread onto a baking sheet (covered with parchment paper) or into another large, flat baking recipient (I use two glass quiche molds). Spread evenly into a fairly thin layer (about ¼ – ½ an inch). 4. Back for about five minutes (I place near the top of the oven). 5. Add the dried fruit and seeds; mix and continue baking until all begins to brown. Don’t overcook or the granola will become too crunchy. This entry was posted in Recipes (All), Recipes (Vegan) and tagged brunch, nuts. Bookmark the permalink. Joy, I am loving these recipes and can’t wait to try them out! My life is very strefull right now. I have a newborn (6 week-old) and a toddler (18 m). They are very young and It127#&8;s a lot of work. I try to go for walks so at least I can have some fresh air!. Thanks for sharing.